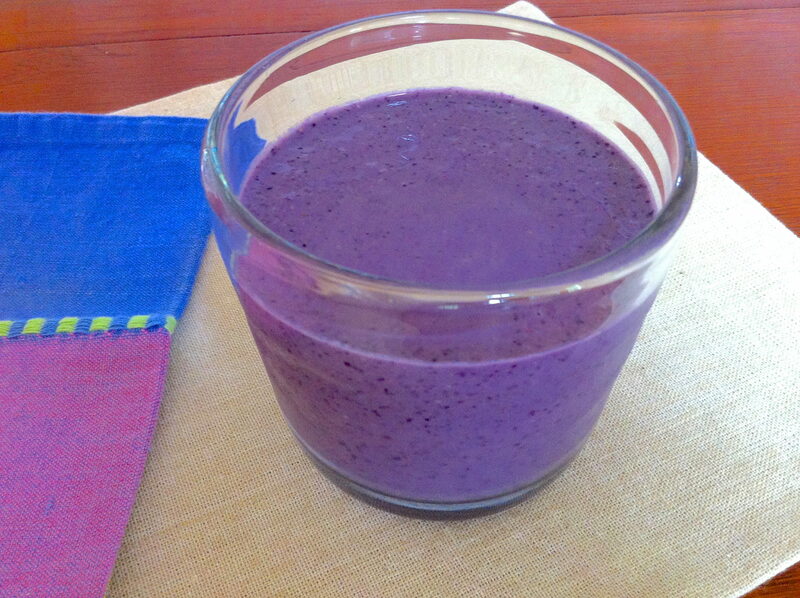 First, I must say that the color of this blueberry smoothie is about as luscious as the taste! Since I first tried the make-ahead smoothie concept, I have been hooked. I love a nice, thick smoothie and typically rely on frozen fruit and ice to get the consistency I prefer. Using the oats and chia seeds, however, is a nutrient-packed way to thicken a smoothie. As the smoothie rests, the oats and seeds expand and the result is a perfectly thick and creamy smoothie, ready to grab and go. This anti-oxidant packed combination is also incredibly flavorful, not to mention colorful. I have been on a blueberry kick recently and have been enjoying this recipe for a quick yet filling lunch. Great for breakfast, too, and I like that I can actually use a spoon to eat it–makes it feel more like a meal. I have tasted the smoothie before the designated soak time is up, and the smoothie still tastes good. However, the flavors will continue to develop as the smoothie thickens so, if you can, wait it out! Avocado adds a wonderful creamy texture to this smoothie. If you prefer not to use the avocado or do not have a ripe one on hand, a banana is a good substitute. Add oats and chia seeds to blender and blend on high until you have the texture of a fine flour. Add the milk, yogurt, blueberries, and all remaining ingredients except the sweetener. Blend on high until the mixture is smooth, scraping down the sides and blending again, as necessary. It is helpful to stir down to the bottom to make sure the oat mixture is fully incorporated. Taste and sweeten to your liking. Blend again to distribute. Transfer the smoothie to a jar or other lidded container. Refrigerate overnight or at least four hours. Will keep 2-3 days in the refrigerator. May be frozen. First allow the mixture to soak for at least four hours in the refrigerator. oh how beautiful is that?? I must try it! and it has to be protein packed. can you taste the avocado though? i just cannot eat avocado, even though I know how healthy they are. I can’t get past the taste and texture. The avocado is subtle but you may notice it, Mary Lou. If you aren’t sure, I would substitute with a banana. Mango has a similar velvety texture, although I have never put mango with blueberries. Hey, that might be a new thing to try! I just love how these smoothies are thick…they seem more satisfying to me and I truly enjoy as a meal. Let me know if you try! I use silken tofu and/or a bit of cooked yam in my smoothies for texture (and protein/nutrients). I never taste them once they’re blended with other ingredients. Avocado is a great idea, too! Great suggestions, Merv! I, too, enjoy avocado in a smoothie. I have made a version of this one with avocado and love the creaminess it contributes. Thank you for the great suggestions…might have to try the yams next! Ann I am reviewing this again and I am going to try soon. I made a smoothie using avacado, recipe was from Eating Well magazine and wow, it was amazing! More like a chocolate shake and all the avacado did was add creaminess, no taste or color at all. I think I have found a way to inorporate them into my diet.. I agree, Mary Lou! Avocados can add so much to the texture of a smoothie without tasting at all like an avocado. Hope you enjoy this version, too! I tried it this morning (the banana version) and I must say that it was delicious. Thank you Ann! I’m so happy you liked it, Celine. Thanks for letting me know!